Ah, the smell of summer is in the air! And, boy, do we have a great summer planned, with new products, great events, and our tenth-year anniversary just a few months away. Well, I guess that it isn’t quite summer yet—technically—but we’re officially kicking off the festivities with a super-sale that will give you access to some of our best-selling products for at least 50 percent off their regular price until the end of the week! 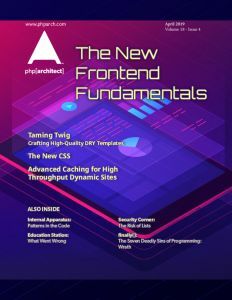 Premium Subscription with Back-Issue Catalogue—Back by popular demand, if you subscribe to the Premium Edition of php|architect, we will throw in every single issue we’ve ever published—including epub and MOBI versions where available for just $10 more. Already have a subscription? No problem—we’ll add twelve issues to your account, top you off with our entire backissue catalogue, and even upgrade you to the Premium Edition if applicable. Backissues 50% off—If you don’t want a full subscription, you can still satisfy your craving for more PHP goodness by buying individual backissues at half price. Get them from our catalogue page. Books 50% off—We’ve put our entire catalogue on sale… including the print editions of every single php|a book! And remember, digital editions of many of our recent books also come in epub and MOBI format. Get them from our book catalogue page. REST Summit Charter Tickets—And finally, the pièce de resistance: our upcoming Online REST Summit. Our previous summits have all sold out, so this time we’re going to give you the opportunity to sign up early, save $40 off the full price of the event, and get four hours of solid training on REST from some of the best experts in our community. Sign up today—we only have very few tickets at this price! That’s all. Enjoy these promos and stay tuned for more exciting news from your friends at php|architect! And finally, a note about the back-issue catalogue: When you complete your purchase, the subscription will be added immediately to your account, but the backissues are added by a separate process that may take up to 24 hours to complete. Don’t worry, though—we’ll send you an e-mail once your account has been updated.